The 1933 double eagle is a United States 20-dollar gold coin. Although 445,500 specimens of this Saint-Gaudens double eagle were minted in 1933, none were ever officially circulated, and all but two were ordered melted down. However, 20 more are known to have been rescued from melting by being stolen and found their way into the hands of collectors before later being recovered. Nine of the recovered coins were destroyed, making this one of the world's rarest coins, with only 13 known specimens remaining—only one of which is privately owned. These two coins should have been the only 1933 double eagle coins in existence. However, unknown to the mint, a number of the coins (20 have been recovered so far) were stolen, possibly by the U.S. Mint cashier, and found their way via Philadelphia jeweler Israel Switt into the hands of collectors. The coins circulated among collectors for several years before the Secret Service became aware of their existence. The matter came to the attention of mint officials when an investigative reporter looked into the history of the coins he had spotted in an upcoming Stack's Bowers coin auction and contacted the Mint as part of his research. As a result, an official investigation into the matter was launched by the Secret Service in March 1944. Prior to the investigation, a Texas dealer sold one of the coins to a foreign buyer, and it left the U.S. on February 29, 1944. During the first year of the investigation, seven coins were seized or voluntarily turned in to the Secret Service and were subsequently destroyed at the Mint; an eighth coin was recovered the following year and met the same fate. In 1945, the investigation identified the alleged thief and his accomplice, Switt, who admitted to selling the nine (located) coins, but said he could not recall how he obtained them. The Justice Department tried to prosecute them, but the statute of limitations had passed. A ninth coin was recovered and destroyed in 1952. In contrast, the 1933 Eagle was issued before Roosevelt's withdrawal order, so they may be legally owned by private citizens. However, it is estimated that no more than 40 exist, the rest having been melted, making them exceptionally rare. The missing double eagle was acquired by King Farouk of Egypt, who was a voracious collector of many things, including imperial Fabergé eggs, antique aspirin bottles, paperweights, postage stamps—and coins, of which he had a collection of over 8,500. In 1944 Farouk purchased a 1933 double eagle, and in strict adherence with the law, his ministers applied to the United States Treasury Department for an export license for the coin. Mistakenly, just days before the mint theft was discovered, the license was granted. The Treasury Department attempted to work through diplomatic channels to request the return of the coin from Egypt, but World War II delayed their efforts for several years. In 1952, King Farouk was deposed in a coup d'etat, and many of his possessions were made available for public auction (run by Sotheby's) – including the double eagle coin. The United States government requested the return of the coin, and the Egyptian government stated that it would comply with the request. However, the coin disappeared and was not seen again in Egypt. In 1996, a double eagle surfaced again after over 40 years of obscurity, when British coin dealer Stephen Fenton was arrested by U.S. Secret Service agents during a sting operation at the Waldorf-Astoria Hotel in New York. Although he initially told investigators he bought the coin over the counter at his shop, he later changed his story. Under sworn testimony, he insisted the double eagle had come from the collection of King Farouk, though this could not be verified. Charges against Fenton were subsequently dropped, and he defended his ownership of the coin in court. The case was settled in 2001 when it was agreed that ownership of the double eagle would revert to the United States government, and the coin could then legally be sold at auction. The United States Treasury issued a document to "issue and monetize" the coin, thereby making it a legal-tender gold coin in the United States. When the coin was seized, it was transferred to a holding place believed to be safe: the treasury vaults of the World Trade Center. When the court settlement was reached in July 2001, only two months before the Trade Center was destroyed, the coin was transferred to Fort Knox for safekeeping. On July 30, 2002, the 1933 double eagle was sold to an anonymous bidder at a Sotheby's auction held in New York for $6.6 million, plus a 15-percent buyer's premium, and an additional $20 needed to "monetize" the face value of the coin so it would become legal currency. This brought the final sale price to $7,590,020.00, almost twice the previous record for a coin. [not in citation given] Half the bid price was to be delivered to the United States Treasury, plus the $20 to monetize the coin, while Stephen Fenton was entitled to the other half. The auction took less than nine minutes. 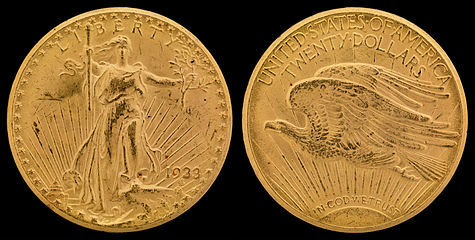 In August 2005, the United States Mint announced the recovery of ten additional stolen 1933 double eagle gold coins from the family of Philadelphia jeweler Israel Switt, the illicit coin dealer identified by the Secret Service as a party to the theft who admitted selling the first nine double eagles recovered a half-century earlier. In September 2004, the coins' ostensible owner, Joan Switt Langbord, voluntarily surrendered the 10 coins to the Secret Service. In July 2005, the coins were authenticated by the United States Mint after working with the Smithsonian Institution, as being genuine 1933 double eagles. According to various accounts, Israel Switt had many contacts and friends within the Philadelphia Mint, and reportedly had access to many points of the minting process. A secondary source reports that the Secret Service found that only one man, George McCann, had access to the coins at the time and served prison time for a similar embezzlement in 1940. Switt may have obtained the stolen 1933 double eagles through a relationship with the head mint cashier. One theory is that McCann swapped previous year double eagles for the 1933 specimens prior to melting, thus avoiding compromise of accounting books and inventory lists. Coin experts in the numismatic world have advanced an argument that Switt could have legally obtained the 1933 coins when he was exchanging gold bullion for coins. Although the Mint records clearly show that no 1933 double eagles were issued, there were allegedly three weeks in March 1933 when new double eagles could possibly have been legally obtained. The mint began striking double eagles on March 15, and Roosevelt's executive order to ban them was not finalized until April 5. On March 6, 1933, the Secretary of the Treasury ordered the Director of the Mint to pay gold only under license issued by the Secretary, and the United States Mint cashier's daily statements do not reflect that any 1933 double eagles were paid out. Until the early 1970s (when President Nixon took the United States off of the gold standard and President Ford signed legislation that again made it legal for the public to own gold bullion), any recovered 1933 double eagle, as gold bullion, was required to be melted. Therefore, while double eagles recovered prior to 1974 were melted down, any double eagle recovered now can be spared this fate. Currently, with the exception of the one sold on July 30, 2002, 1933 double eagle coins cannot be the legal possession of any member of the public, as they were never issued and hence remain the property of the United States government. On October 28, 2010, United States District Court judge Legrome D. Davis released a 20-page decision regarding claims to the coins by descendants of Israel Switt, leading to a trial in July 2011. On July 20, 2011, after a ten-day trial, a jury ruled unanimously in favor of the United States government concerning ownership of the ten additional double eagles. The court concluded that circumstantial evidence proved that Israel Switt had illegally obtained the coins from the United States government, and that they are thus still government property. The decision was affirmed on August 29, 2012, and the plaintiffs planned to appeal. In 2003, the ten double eagles were stored at the United States Bullion Depository in Fort Knox, Kentucky. They were shown to jurors in Philadelphia during the July 2011 trial, and were then returned to Fort Knox, where they were to remain until a decision was made regarding their disposition. In April 2015, a United States federal appeals court ordered the coins returned to the Langbord family because the original asset seizure was conducted improperly, as the government failed to file a judicial civil forfeiture complaint within 90 days of the family's seized asset claim. This order was reversed on July 28, 2015, and in October 2015, an en banc session was held with 13 judges from the Third Circuit Court of Appeals, where they heard oral arguments in the ongoing appeal. On August 1, 2016, the judges reversed the previous ruling, finding the coins to be property of the United States government. The Langbords appealed to the U.S. Supreme Court, which on April 17, 2017 denied certiorari. In 2004, the National Collectors Mint (NCM) released gold-plated replicas of the 1933 double eagle, ostensibly under the authority of the Northern Mariana Islands, a U.S. Commonwealth. The NCM advertised and certified the coins as "legal tender of the CNMI", a bogus designation. The replica coins did not include any "replica" or "copy" indications on their faces. The replica coins matched the original coins in concept of design, but they were not exact duplications of the coin. The only difference in basic design between the NCM replicas and the original double eagle was the addition of the CNMI territorial seal under the U.S. motto on the reverse. After some controversy over the nature and marketing of these replicas, the coins were reissued with the word "copy" stamped across the eagle's abdomen. ^ Donovan, Karen (December 26, 2006). "Buried Treasure". Trusts and Estates. Archived from the original on 24 December 2010. Retrieved 26 January 2011. ^ Worden, Leon (January 2006). "1933 Double 'Legal'—Barry Berke: The Saints' Biggest Advocate". COINage: 46–48. Retrieved 26 January 2011. ^ a b "United States Mint Recovers 10 Famed Double Eagles" (Press release). United States Mint. August 11, 2005. Archived from the original on August 21, 2012. Retrieved July 23, 2011. ^ Loftus, Peter (July 21, 2011). "Family Loses Coins Worth Millions in Dispute With U.S." Wall Street Journal. Archived from the original on 22 July 2011. Retrieved July 23, 2011. ^ Loftus, Peter (September 6, 2012). "Rare Gold Coins Belong to Mint, Judge Decides". Wall Street Journal. Retrieved September 7, 2012. ^ Roach, Steve (July 21, 2011). "1933 double eagle trial: At long last, a conclusion". Coin World. Archived from the original on September 25, 2011. Retrieved July 23, 2011. ^ Ashby Jones (April 17, 2015). "Court Orders U.S. Mint to Return Famed Coins to Family". Wall Street Journal. Retrieved April 20, 2015. ^ Hardiman, Thomas. "Decision in Langbord v. US Treasury, 3rd Circuit Court of Appeals". Retrieved November 20, 2016. ^ Guarino, Ben (August 2, 2016). "'A high-stakes dispute over ten pieces of gold': Court reclaims priceless Double Eagle coins for U.S. government". washingtonpost.com. James Twining, The Double Eagle, an investigation novel involving the FBI, United States Department of Treasury, Fort Knox, etc. "World's most expensive coin displayed in London". BBC News. March 2, 2012. Retrieved December 7, 2017.